A stylish, artistic and hyperkinetic action film, Baby Driver excels at burning rubber to a thumping soundtrack. Humour, idealized romance and violence have rarely mixed better. In Atlanta, an orphaned young man known as Baby (Ansel Elgort) works as the getaway driver on jobs planned by master criminal Doc (Kevin Spacey). Constantly listening to music to counteract severe tinnitus and push away the demons of his parents' death, Baby owes Doc a debt, and is working it off as the wheelman in a series of high profile armed heists. Baby lives with the elderly and deaf Joseph (CJ Jones), who is supposedly his foster father although Baby now looks after the wheelchair-bound old man. Doc's regular gang members include the quiet but dangerous Buddy (Joe Hamm), his girlfriend Darling (Eiza González), Griff (Jon Bernthal) and the slightly unhinged Bats (Jamie Foxx). In between jobs Baby meets diner waitress Debora (Lily James), and the two start a relationship and plot a future life away from Atlanta. But Doc will not let Baby go easily, and one final job takes a dangerous turn. Written and directed by Edgar Wright, Baby Driver exudes a sense of detached cool. The film is modern-day full length music video, largely disconnected from reality and fully embracing stylized and high revving action as its primary mission. That Wright also provides a reasonably interesting, rounded and conflicted central character in Baby is a bonus, although Baby's exceptional skills behind the wheel and his overall calm demeanour in the face of unfriendly villains and street level carnage stretches all credible limits. But none of that really matters, as character realism is a distant objective in this narrative. Similar to 1978's sparse The Driver (and much less similar to 2011's brooding Drive), Baby Driver sets out to create insane excitement through a series of breathless urban chase scenes with an aloof protagonist in the driver's seat, and succeeds in creating some of the best sequences of grounded automotive mayhem. At once modern and old-fashioned, Wright threads the needle by keeping the action just on the right side of plausible in relative cinematic terms. The action scenes are properly spaced out to allow the story breathing room to progress, and when they do arrive, no effort is spared to maximize the highest possible revolutions per minute. And it's all set to the music mix playing through Baby's earbuds, Baby Driver an audio experience as much as it is a visual feast. Baby's mother was a musician, and he insists on having the right tune playing at exactly the right time even when anarchy is about to be unleashed. Wright grabs a lot of tense and fun mileage by having his young hero insist on synchronizing his life to his chosen soundtrack, no matter what is happening around him. While Baby is an innocent among wolves, the evil doers surrounding him are not kidding around. Buddy, Darling and especially the appropriately named Bats are various degrees of crazy, and this is a violent film where obscenities, threats, shootouts, corrupt cops, blood, violence and various forms of gruesome death are thrown at the screen. The contrast with Baby's sweet budding romance with Debora is sharp, Wright giving his young hero every opportunity to differentiate himself from the sordid world created by the likes of Doc. 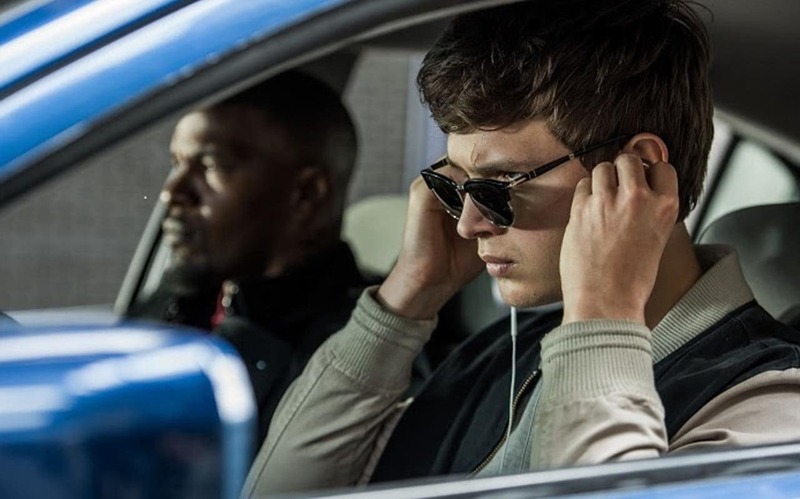 Hip, unflappable and built for speed, Baby Driver rocks to his own tunes.